As companies continue to do business in more parts of the world, foreign exchange risk has ever-greater visibility at the treasury level. FDE talks to Steve Everett, global head of cash management and head of transaction services products EMEA at Royal Bank of Scotland, about good liquidity management in a globalised world. Treasurers and CFOs have had a lot to think about over the past few years. The gradual weakening of Europe's common currency and the global economy has forced many to rethink fundamental questions about liquidity management, such as where cash is sitting, and how much of it there is and with whom. These pressures have occurred against a backdrop of relentless globalisation. The emergence of new markets in Asia, Latin America and Africa have all changed the way today's corporates function. In most cases, diversification brings the prospect of new markets and economies of scale, but it also increases the risks associated with foreign exchange and interest rates. Even companies that don't necessarily operate in a specific area can find themselves exposed to different risk types within their supply chain. "Over the last few years, exchange rate volatility has increased," says Steve Everett, global head of cash management and head of transaction services products EMEA at Royal Bank of Scotland (RBS). "Our clients are now doing business in more locations, so it's important that we have a range of tailored solutions that enable them to process their transactions and manage the risks that arise." GlobalXchange is a set of solutions RBS delivers as part of its foreign exchange cash management offering. The platform, which combines the bank's focus on foreign exchange with its strengths in transaction banking, varies from single to multi-account solutions. "What we've done is bring together many of our foreign exchange cash management capabilities under one umbrella offering," explains Everett. "At the end of the year, we'll be deploying new solutions that we think will enable our clients to do more around low-value, high-volume payments, while improving efficiency and minimising foreign exchange risk." "The dangers of sitting on idle cash are likely to remain at the top of the agenda for corporates that want to have freedom of working capital." One way RBS already does that is by offering companies security and certainty in their foreign exchange conversions at the time of a transaction by using rates determined directly from the trading rooms. Another solution RBS offers is the ability to make payments through multiple sources anywhere in the world - without the client actually needing to have an account at the beneficiary end. "For example, we can make payments from a bank account in the UK to Singapore," Everett says. "In that case, we can debit the client so that the beneficiary receives the receipt in Asia without the need to actually create an account. Alternatively, if the client does want to hold master accounts in certain locations, we can still provide payment services to other parts of the world." Conducting business in foreign countries also creates the risk of trapped cash. Countries such as India and China have fundamentally different regulatory structures from other areas such as Singapore, Hong Kong or Australia. That creates problems for corporate treasurers who find themselves unable to move money across borders to different parts of the business. As countries such as China liberalise and the barriers to cross-border cash fade, the problems associated with trapped cash may gradually change. To some extent, that's already happened. For example, China has sanctioned certain offshore areas where the renminbi can be traded freely. "As that currency becomes an opportunity, it starts to settle outside of mainland China into Hong Kong and other locations," Everett says. "I think, looking forward, this currency is going to become an even bigger part of the cash management process for today's corporates." Even with fewer trade barriers, the dangers of sitting on idle cash are likely to remain at the top of the agenda for corporates that want to have freedom of working capital and unlock the potential of the cash they hold. "We can ensure that our clients' balances can be used and converted into a single currency, either notionally or physically," Everett says. "It's important that they have visibility of their balances and liquidity within the internal workings of their company on a day-to-day basis. For those areas that don't have local regulatory requirements to leave cash inside the country, RBS can offer real-time movement of cash all around the world." The last two decades have seen other deep-seated changes to the relationship corporates have with their banks. This shift has been noted by industry leaders like Everett. As well as extending its range of traditional banking services by opening up physical branches in different areas, RBS has responded to those changes by developing technology capable of centralising a treasurer's view of their business throughout the world. "Historically, corporates would have started off with a set of banking relationships - probably on a country-by-country basis," he says. "But over time, the emergence of global liquidity products has enabled us to supply banking services in a way that can improve the visibility of cash at the centre. Our technology can enable payment processing, provide global information around account balances in real time, and allow the user to sweep and move money around." The Single European Payment Area (SEPA) is another issue at the top of the agenda for many RBS corporate clients. The scheme is designed to harmonise the fragmented European payment system, as it remains a key barrier to cross-border trade and market efficiency. Some of the larger corporates have already begun to invest in SEPA but others are only now putting thought into the changes required by this regulation. "Actually, I worry about SEPA readiness more than I do the eurozone," Everett says. "By February 2014, our clients will need to execute their businesses in the format required by SEPA - and that poses a challenge to everyone that wants to move money around Europe. "Many of our clients are working closely with us to understand the impact of SEPA. This will depend upon various factors such as the breadth they have across Europe, the nature of their underlying business, their ERP systems and so forth. We work with a broad spectrum of corporates. Some are mobilising their resources towards SEPA while others are still a long way off. Ultimately, we will be a key partner in making sure they are compliant," he adds. That's the theme of a recent international cash management handbook with which RBS has been involved. The book discusses many of the challenges and opportunities that SEPA compliance poses to European corporates. "I worry about SEPA readiness more than I do the eurozone – it poses a challenge to everyone that wants to move money around Europe from February 2014 onwards." "While SEPA was spoken about in the previous edition of the book, it's now a reality," Everett says. "The handbook describes a number of things that banks and corporate treasurers can do to ensure they send us payment instructions in the necessary format and manage their direct debit mandates." It also discusses the opportunities SEPA brings. With one single clearing system in place, companies will no longer have to deal with local accounts across various countries. That should ease some of the barriers to trade that have held back greater European integration in the past. As a global transaction bank in over 36 countries worldwide, RBS is ideally placed to guide its clients through the challenges and opportunities thrown up by the forces of globalisation. Problems with the global economy together with the raft of regulatory changes sweeping through Europe are likely to intensify the nature of those risks for the foreseeable future. 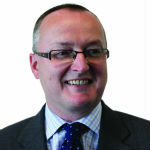 Steve Everett, global head of cash management and head of transaction services products EMEA at Royal Bank of Scotland.